When you enter Plimoth Plantation, you walk back in time and experience life--or, at least observe it--as our forebears did in the 17th century. Despite the throwback to an era gone by, this beloved Massachusetts attraction still needs modern-day technology in order to operate (and compete) in the 21st century. This is where Shanahan came in two years ago. 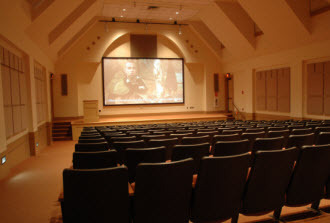 Plimoth Plantation’s main campus housed a facility with two small presentation rooms that were used for various presentations, such as educational movies about the history of the plantation and the surrounding area. The electronic systems in these rooms were antiquated. For example, the slide projectors broke down repeatedly and were of poor quality. Shanahan improved the system by installing two 5000 lumen DLP projectors. 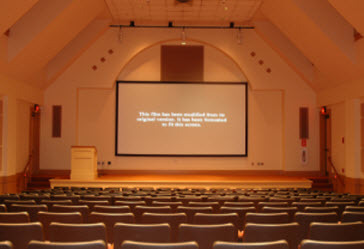 This upgrade gave the presentation rooms increased capabilities, and the projectors provided brighter and clearer pictures. Shanahan also improved the audio system by installing a complete surround-sound system, including a 7.1 capable surround-sound processor and a vast selection of JBL speakers. In addition to these basic system upgrades, Shanahan improved Plimoth Plantation's system by installing a 6.4-inch color touch panel for easy show control. The panel is custom programmed according to the video/lighting products, and it controls nearly all the aspects of the Shanahan install. With the push of one button, the lights dim and the presentation begins. When the presentation completes, there’s a 10-second pause and the lights come up again. This feature allows for even the most tech-phobic personnel to operate the equipment easily and effectively. A Media Server was installed that allows Plimoth Plantation to upload video directly from The History Channel. Two wireless microphones were also installed, providing mobility for presenters. 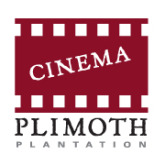 These improvements have provided Plimoth Plantation with many more revenue-generating opportunities, such as the transformation of a presentation room into the Plimoth Cinema, where it features indie and artistic films. With Shanahan’s inventiveness and design, the room went from a relic of outdated equipment to a state-of-the-art theater. Before the upgrade, Plimoth Plantation could present only slide shows. Today, it has the capability to present and show a vast variety of video in numerous formats. Oscar-winner Chris Cooper, who lives in the area, premiered one of his films in Plimoth Cinema. Sounds like an award-winning moment to us. Shanahan prides itself on maintaining the historical integrity of buildings, such as Boston's Trinity Church and the city of Lynn's Memorial Hall, while bringing them into the 21st century in terms of technology. Would you like to learn more about what we can do for your business, school, house of worship, or historical site? Contact us today.